For the first time in Australia, Captain Cook Cruises will offer an option to enjoy a return cruise to Optus Stadium for all AFL matches in the 2019 season. This unique experience of traveling from a capital city to a world class stadium to watch AFL, international rugby, soccer or concerts is an exciting new product open to visitors and locals alike. 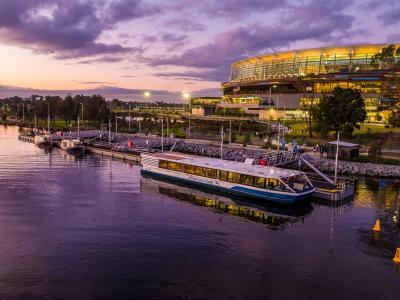 Enjoy exclusive luxury return transport to Optus Stadium from Mosman Park, Point Walter or Barrack Street Jetty via the beautiful Swan River with Captain Cook Cruises. Board the VIP stadium cruise away from the crowds and enjoy a relaxing afternoon experience before the game. Following the game, your vessel will be waiting to transfer you back to your jetty of choice. Captain Cook Cruises are also running a transfer in conjunction with Three Pound Group wherein guests can book a departure from the Reveley at Elizabeth Quay and enjoy drinks onboard while they cruise up the Swan River towards Optus Stadium. Upon disembarking, guests will get VIP entry to the Camfield where they can enjoy the game day atmosphere in the largest bar in Australia before heading in to watch the game. These new options come at an exciting time for Captain Cook whose Swan Valley Cruise was announced as the 2018 Travelers Choice in TripAdvisor’s Top 10 Experiences in Australia.